Random House has given us a bonus batch of Early Reviewer books this month! There are six titles up, and a whopping total of 470 copies to give out. So go sign up (if you haven’t already), and then request your copy to read and review! *In another country? Don’t despair. The May batch, which will be out very soon, includes books for residents of the US, Canada, and the UK and Australia! April’s batch of Early Reviewer books is up! This month features 66 different books from 33 different publishers, totaling 1,599 copies. It’s our biggest batch ever–I know, I said that last month, but apparently we grow fast around here! Sign up to get a free advance copy, in exchange for writing a review. If you’re already signed up, make sure to check that your name and mailing address are correct (here). More help available in the Early Reviewers Frequently Asked Questions. The deadline to request a copy is Tuesday, April 8th at 6pm EDT. Audio books. We have our first audio book in this batch, (Elizabeth Berg’s The Day I Ate Whatever I Wanted). Love listening? Tell us, and we’ll try to get more audio books included. Author Chat. We’re about to debut a new feature, Author Chat. 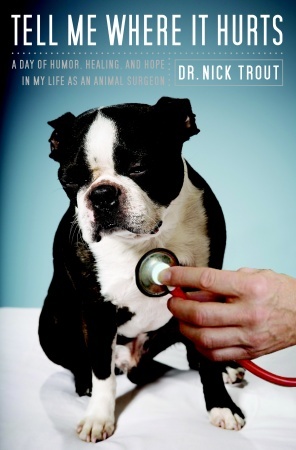 To start, Broadway Books is giving out copies of Tell Me Where it Hurts, Nick Trout’s new book about a day in the life of an animal hospital. Read it, review it, think about it. Then Nick will be on LibraryThing from April 14th through the 30th to answer questions, talk about his work, etc. More details on Author Chats to come, so stay tuned. New Publishers. As I said, there are 33 different publishers participating this round. Thanks to all of them, and of course, thanks to the publishers that just keep giving us books! You’ll also notice that a few of the books are already released. A few of publishers new to Early Reviewers decided to include some back-list titles as well as new ones, to kick things off. Though we generally prefer pre-publication books, we decided to allow these less “release-driven” titles into the program. Make sure to check the flags to see whether you’re eligible to receive each book. Most books are open to residents of the US and Canada, several are open to residents of the UK only. Pay attention–only the flags will tell you which is which!